The Davis Art Gallery is currently holding a show called The Art of Fiber. It has always interested me that fiberarts were considered a “minor art.” It is one of the oldest art forms next to ceramics. Speaking as a person who considers a beautifully presented plate in a restaurant as a work of art, I have a hard time considering something like this carpet anything less than a work of art. How often do we say something like a donut or bouquet from a florist is a “work of art”? I guess this could be considered my ongoing ode to things in everyday life that are works of art although they are not observed as such. 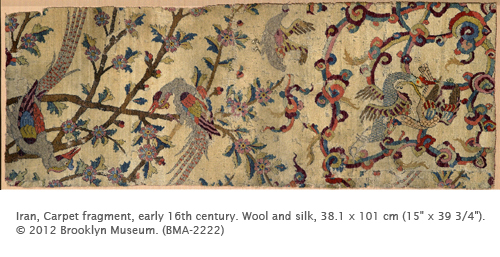 Textiles were used for a variety of purposes outside of clothing by all members of Islamic societies. Unlike Western Europe, where furniture was designed to elevate activities off the cold, damp floor, a rug or mat was sufficient to keep down dust and provide warmth during the brief cold season. The use of textiles instead of furniture meant that one room could serve multiple functions. Curtains and rugs were hung on the wall, provided privacy in doorways, and served as dining and sleeping cover for the floor. Cushions were used to support people while eating. 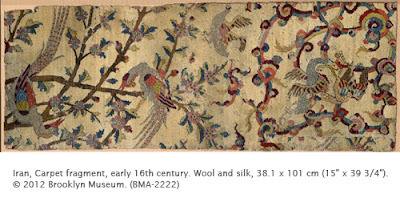 Textiles were particularly important for nomads, who used material to carry their belongings. As nomadic groups entered into mainstream Islamic society, their tent types were adapted for use by the wealthy, varying in size and the luxury of materials used. Luxurious textiles were known in Muslim lands from the earliest period, for the Koran speaks in several places of the sumptuous fabrics to be enjoyed in Paradise (Koran 22:23, 35:33, 55.54). Additionally, the Prophet’s cloak figures prominently in many parts of the Koran. Four fibers were used for textiles in Islamic lands: wool and linen around the Mediterranean, and cotton and silk in Asia. This piece is particularly interesting for the combination of wool and silk. Wool and silk were typical combinations in European tapestries during the Renaissance and Baroque periods. Activity: Making a Yarn Painting. Sketch an animal or plant on a piece of cardboard or composition board. Use squeeze bottle glue to initially outline the subject in black yarn. Fill in the subject and background in various colors of yarn. For large areas where the yarn needs to be laid down in concentric rows, use a brush to apply the glue.